La Belle Assemblée, June 1811. 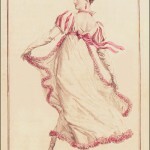 This print is especially striking in its lively movement, showing what a ball dress would have actually looked like when dancing. Besides the beautiful dress, I love the complicated hairdo, with twists of pearls and a gold comb, which we are allowed to see much better from this rear view. The suggestion of a dance movement also allows a glimpse of the clocked stockings. Note also how loosely the gloves fit. 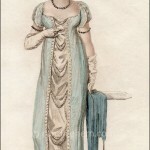 This is very typical in English evening dress, where the glove is above the elbow in length, but is not tight at the top. Instead it is allowed to loosely fall down the arm, sometimes below the elbow. Generally, long gloves were tied on at the top, but it seems to have been the fashion at this time to tie them very loosely, or perhaps not at all. 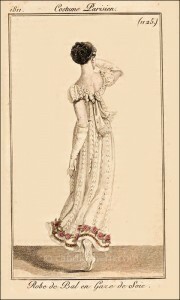 This print is another example of a British publication “borrowing” a print from the popular French publication Journal des Dames et des Modes. Copyright laws were pretty loose, and almost non-existent between countries, so almost every ladies’ magazine in England made liberal use of the fashion prints from this Parisian magazine. 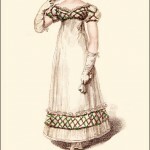 Here is the original French print, from the Paris edition of Journal des Dames et des Modes, February 1811. Often an English print showed slight modifications to the French print, but this one, as you can see, is almost an exact copy. 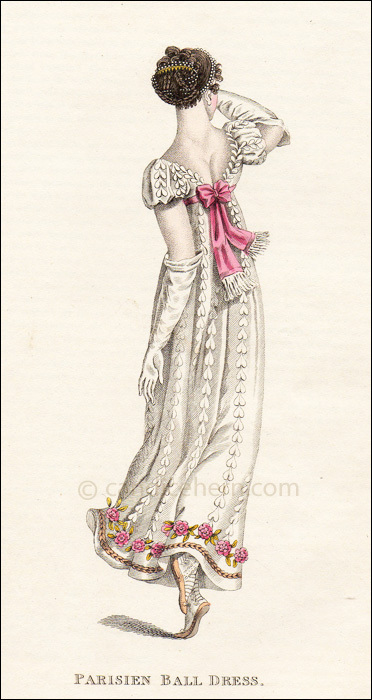 The most obvious difference is the sash and bow in the back being painted pink in the British print. Even the complicated hairstyle is identical. The British print is not a reverse or mirror image of the French print, indicating it was completely re-drawn, and not created by pin-pricking the original.